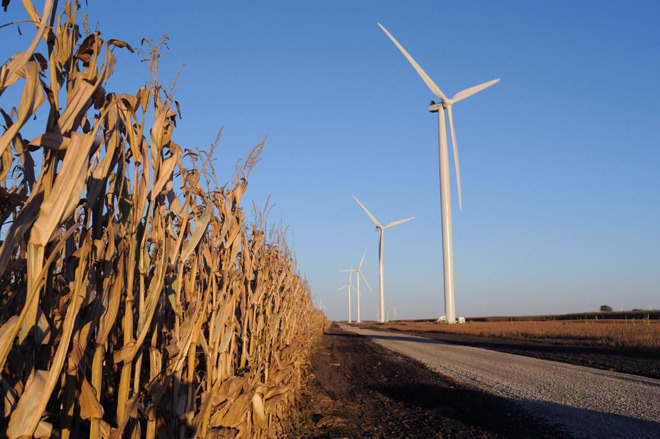 FERC approved an uncontested partial settlement between Northern Indiana Public Service Co. and the owners of seven Indiana wind farms that contend the utility overcharged them for transmission upgrades. The April 21 order (EL14-66-003) resolves issues related to NIPSCO’s 138-kV transmission upgrade funded by the Meadow Lake and Fowler Ridge wind farms. Under the settlement, the utility will pay $400,000 to Meadow Lake and $450,000 to Fowler Ridge to withdraw their complaint. E.ON Climate & Renewables North America filed the original complaint against NIPSCO in 2014, objecting to the multiplier rate used in two transmission upgrade agreements with its Pioneer Trail and Settlers Trail wind farms. FERC later that year ruled that the multiplier was unreasonable and instructed the two companies to enter into settlement proceedings to determine a new rate (EL14-66). FERC’s acceptance of the partial settlement also closes out Meadow Lake and Fowler Ridge’s request for rehearing in E.ON’s complaint (EL14-66-002). NIPSCO asked FERC to dismiss a complaint by two wind farm operators alleging they were overcharged by the utility for transmission upgrades to reduce congestion-related curtailments. Lawmakers gave preliminary approval Wednesday (March 13) to a bill that would allow electric utilities to obtain rate increases for transmission and distribution upgrades outside of a base rate case.